Thank you to everyone involved for a fantastic Eurovision Weekend 2016 ! For the fifth anniversary of the Eurovison Weekend there will be a fantastic celebration. 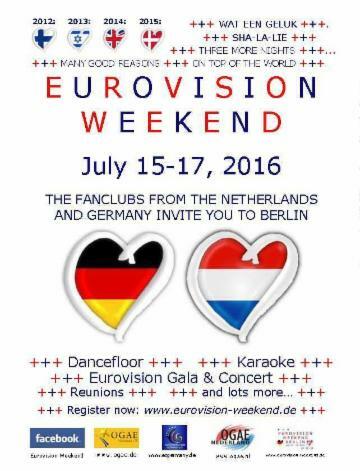 Get your ticket, book your accomodation and spend a great weekend in Berlin among Eurovision fans. Find out more about the programme and details in the invitation or on our Facebook Event Site. Breaking News: Laura Pinski, being fourth in the German preselection 2016, comes to the Eurovision Weekend ! Huge response to the new OGAE-vision Song Contest: Contestants from all over Europe take part in the debut of the contest. Breaking News: Zoë, this year's representative from Austria, comes to the Eurvision Weekend ! 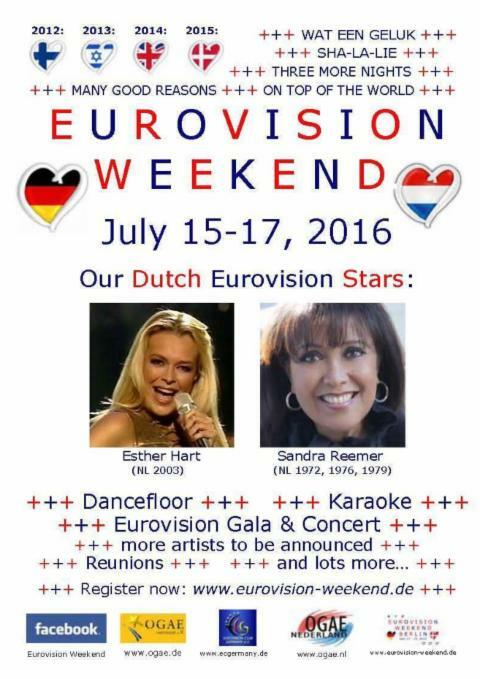 The Dutch artists of the Eurovision Weekend 2016 are Esther Hart and Sandra Reemer...welcome to the fifth edition of the Eurovision Weekend ! Tickets are available for 36 €, everything included. You can register here or send an e-mail to tickets@eurovision-weekend,de with the number of tickets you want and transfer the money to the account of OGAE Germany or you can get your ticket online with a small fee of the ticket distributor here. There is a special offer of Hotel Ramada Alexanderplatz for all guests of the Eurovision Weekend 2016, that you get with your ticket order. The partner fan club of the 2016 edition of the Eurovision Weekend is OGAE Nederland. For all more information go to the Eurovision Weekend 2016 site, for the programme and further details see the invitation. We are looking forward to a fantastic event and will soon announce more details. Join the annual club reunion in Munich on the 23rd of January for some more news ! The first helpers meeting is on January, 31st, 2016 at 4 pm in the Sonntags-Club (one of the host locations), anyone willing to help is very welcome ! For questions: info@eurovision-weekend.de !